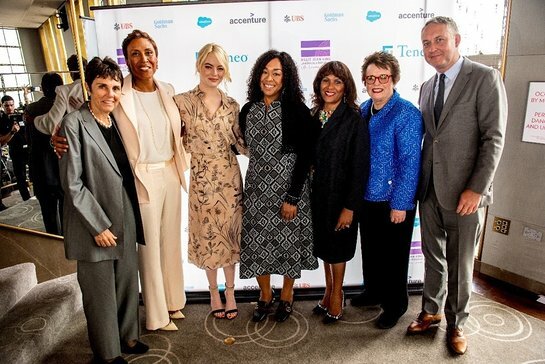 The Billie Jean King Leadership Initiative (BJKLI) last week convened leaders from a variety of sectors to hear from Emma Stone, Billie Jean King, Shonda Rhimes and Christiane Amanpour on the importance of equity, inclusion and the power of the individual to make change. The luncheon kicked off with an address from Christiane Amanpour, who was presented with the first BJKLI “Inspiring Leader” award before she departed for duty at the United Nations. Speaking about organizations like the BJKLI, Ms. Amanpour said, “It is more important than ever in current conditions that we raise our voices and discuss these issues.” She also discussed the critical need for leadership referring to the global leaders she meets every week, including during UNGA, and encouraged the audience to recognize their power to impact change. Following the “Inspiring Leader” award presentation, the crowd watched a video showcasing the previous three years of BJKLI symposiums and those that have received the award, including; Valerie Jarrett, Special Advisor to President Obama; Gracia Martore, CEO of Tegna; Martine Rothblatt, CEO of United Therapeutics; song, film and theatre legend Cyndi Lauper; Marc Benioff, CEO of Salesforce; and Heather O’ Reilly of the U.S. Women’s National Soccer team. The event also included a conversation with Billie Jean King and Emma Stone moderated by Kim Davis, Senior Managing Director of Teneo, and member of the founding team of the BJKLI. The three discussed the making of the Battle of the Sexes film, the reason behind sharing the story, lessons from Ms. King’s life dedicated to social justice and equity, and Ms. Stone’s personal connection to the film including her own path to leadership. The luncheon concluded with a live auction and the iconic phrase from Billie Jean King “Go For It.” As the crowd exited, they were treated to Sara Bareilles' new song “If I Dare,” written specifically for the film. BJKLI was founded in 2014 by social justice pioneer and sports icon Billie Jean King, her partner Ilana Kloss, and the global CEO advisory firm, Teneo, to move the needle on issues impacting diversity and inclusion by inspiring future leaders and motivating those in positions of power to promote diverse identities and challenge the status quo. Leading sponsors of this year’s annual fundraising event included: Accenture, Salesforce, UBS, Goldman Sachs and the Kraft Group. Members of the Billie Jean King Leadership Initiative Advisory Board include: Billie Jean King, Founder; Ilana Kloss, Co-founder; Paul Keary, Co-founder and COO, Teneo Holdings; Pablo Salame, Global Co-Head, Securities Division, Goldman Sachs; Christiane Amanpour, Chief International Correspondent, CNN; Jason Collins, Former NBA Player and Civil Rights Advocate; David Furnish, Chairman, Elton John AIDS Foundation and CEO, Rocket Entertainment Group; Maritza Gomez-Montiel, Former Vice Chairman and Deputy CEO of Deloitte; Sir Elton John; Jonathan Kraft, President, The Kraft Group; Robert McCann, Chairman, UBS Group Americas; Pat Mitchell, Founder and CEO, POW! Strategies and Executive Producer of TEDWomen; Robin Roberts, Anchor, ABC’s Good Morning America; and Michael Strautmanis, VP of Civic Engagement for the Obama Foundation.